﻿Yet another episode of Weigh In Wednesday. Well lets just say that I started off this morning fuming mad about my weight this morning. 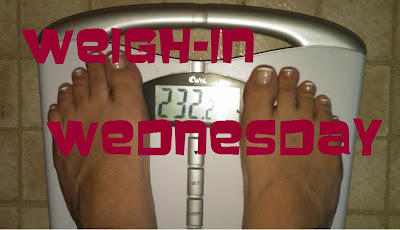 I was hoping after a crazy challenge of Master Cleanse that I would see some good weight loss. Well I did not. NO NO Weight Loss!!!!! This mornings weight came in at a whopping 232.0 That is up over 2 pounds. I was absolutely livid but then I went for my run, got my head together and realized that I did not weigh after vacation. I know that I was up after vacation but dang how much did I manage to gain in a 4 day stretch of time. Anyway, that did help me a little bit, but if I said that I was not angry then I would be a lying little blogger. I feel like the motivation is there and the work is there but these scales are not working in my favor. I know I preach all the time that the number doesn't matter but I would really like to see this number go down and stay down for a while. In the last month I have lost about 200 lbs but it has been the same 200 lbs between 235 and 228! AHHHHHHHHHHHHHHHHHHHHHHH! Let me know how you all did this week. Why are you doing these diets again? I think you should stop and just work out and do a low cal diet. Your body might be rejecting these diets because of the "yo-yo" effect. You could be hurting yourself. Be careful! Bethany, I'm doing this for 2 reasons. For starters, I have hit a plateau and everything I have read says change things up when you hit a plateau. So that is what I am doing. At the same time, I have people stop me all the time and tell me they are doing some stupid crazy things to lose weight or reduce body fat. Well I cant very well call them stupid if I never try them and see how they really work. Hence, I can now tell people that Master Cleanse did nothing "for me." But when they talk about low carb I don't have much room to say anything because I have never done it. Two birds one stone. I might not see any results from these few diets that I am trying but I will know, and I may fall in love with one of them and see that it works great for me and my body. Just a little FatGirl experiment! Melissa, Master Your Metabolism is the plan that I have followed for about a year now and I really like it. I am not able to afford all organic products and I have to drive to a neighboring city to buy organic groceries. I liked that she made it very clear which foods were most important to eat organic and I was able to request those at my local grocery and they started carrying them. I will go back to this plan once Im past my fad diet challenge unless one of these is just great and I want to stick with it for a little while longer. More than that, yeah for joining a gym. I know you will just love it. I have found so much support from my friends at the gym and I wish you the same luck. Who would have guessed that I would start working at the gym? Emily, have you been to the doctor and had your thyroid checked? If your thyroid is off at all, no matter how much you diet and exercise you will not lose weight. You may have to get a second opinion if you have had it checked before. Also, have you bought any B6 and tried that? I bought some last week and lost 3 pounds.